When we are not visiting the other islands or one of the other five branches here on Guadeloupe, we attend the Capesterre Branch. This is the branch that we helped move into a new building when we first arrived. The members have really been kind to us and we feel a home there. Elder Malmrose plays the piano and Sister Malmrose leads the music when we are in town. Sister Malmrose gave her first Sacrament Meeting talk in French in this branch. It was a good experience but we are not sure how much of it they understood, but they were nice about it. It was a talk on the first principle of the Gospel, Faith. We all had to have faith that she wouldn’t faint, and she didn’t. They held a talent show the other evening. We borrowed a guitar and sang one of our duet folk songs. Now we have our own guitar, which we bought when we traveled to French Guyana. They were so expensive here in Guadeloupe, that we hadn’t considered buying one. When we got there, they had a real cheap one, and we bought it and brought it back home so that we would have something to play occasionally. We don’t have much free time, but it is here when we do. The people here do love to talk and sing and dance, so it wasn’t hard to get people to perform. It was a lot of fun for everyone. The Relief Society sisters occasionally get together for a “girls night out”: This is one of those times. We went into the city of Pointe-A-Pitre and sat on the benches on the water front, where we had a little lesson. Then we went and had refreshments and just enjoyed being together. These are wonderful sisters and I really love being with them. One of them said that she would like to be my adopted daughter. I told her I already had two daughters but that she could be my little sister. What sweet people. This mission has more couples than any other mission. One reason is that it is spread out over many islands, cultures and languages. This makes it very difficult for the Mission President to travel and supervise all the different places. He and his wife travel almost constantly. It is helpful to him to have couples in as many areas as possible, to assist him with many of the logistics and help with the missionaries. We were all invited to Trinidad where the West Indies Mission Home is headquartered. 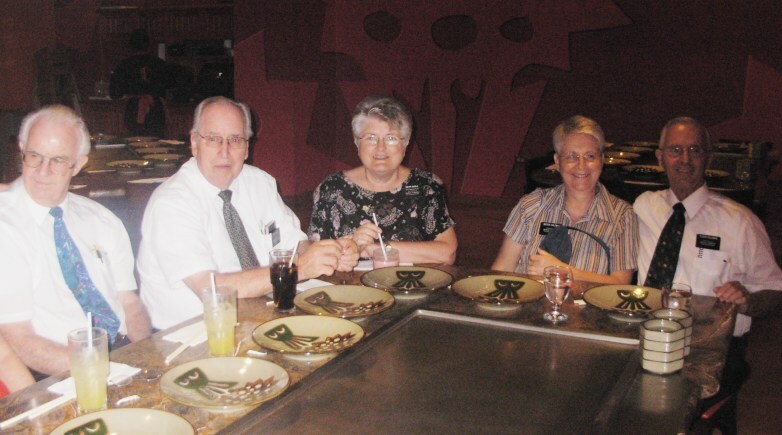 They treated us to Benihana’s restaurant, and that was like a touch of home. We stayed in the mission home and had a lot of fun, as well as learned and shared many things in our workshops. 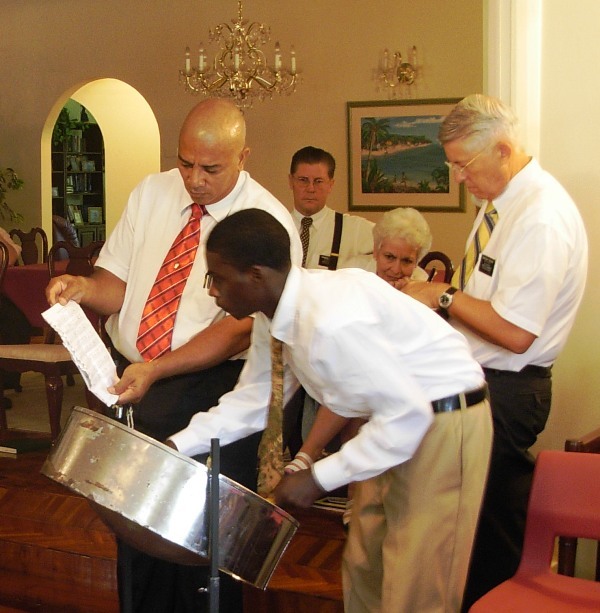 They invited one of the local members to come in and play the steel drums. He did a great job and played some of the Church songs. We didn't realize how beautiful they could sound on that instrument. As you can see, the Priesthood brothers helped out in the kitchen. Now, that was a unique experience. The Dunn’s are in the mission presidency and work in the mission office. We knew them from years ago in Pocatello. We also met several other couples, whom we have known over the years. Sister McGhie is first cousin to Cathlin Fife from Seattle. It is a small world, and there are no coincidences. 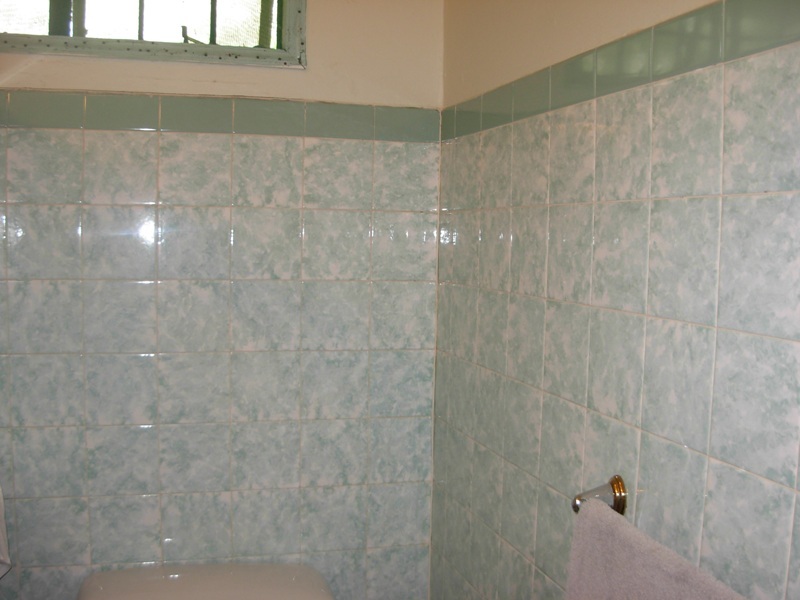 The tile and wood work in these houses is very beautiful and helps make the concrete buildings much more attractive. There was a hurricane watch the day we were to fly home. 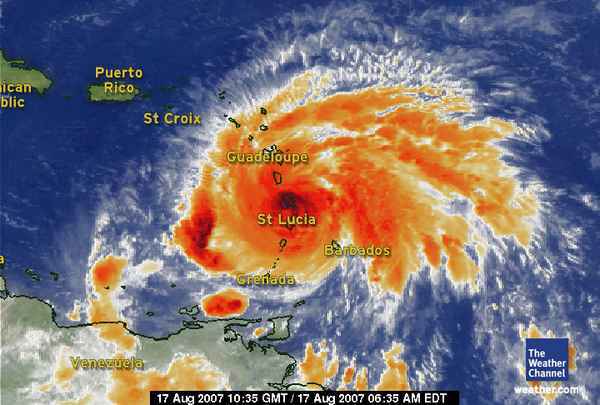 It did hit the Caribbean, but it wasn’t bad where we were. The bad thing is that the day we flew home, all the people who couldn’t fly the day before, were lined up and waiting to try to get a plane. The airports were a mess, but we still got home O.K. There wasn’t much damage on our island, and our missionaries were all fine. Never a dull moment. There were many hurricanes predicted this year, but only one hit and a few tropical storms. They are really wild with lots of rain and wind. They close the schools down and everyone stays in, if possible. The hurricane season is over soon, so we hope we have dodged the bullet this year. One of our areas is in the south of our island called Basse Terrre. We have two Elders down there now and will soon be adding another set and opening up a new area. They have land for a chapel already purchased down in that area, but the Church needs to grow some before we can build. It is near the seat of government of the island and is somewhat cosmopolitan. Elder Doumbia has family in one of the other French islands of Martinique, so when we went there and met them they made us promise to give him a big bisou (kiss) for them. We did so and had Elder Pahio, his companion from Tahiti, take the picture. That was fun. In the north of the island is a place called Moule. These Elders (Crnich and Procter) invited us to the baptism of this sweet Creole sister. She is dressed in one of the beautiful traditional plaids. We have learned a few words in their native language, and when we use them, they always get a big kick out of it. Probably because they don’t expect to hear white people speaking it. There is a bit of culture shock when we first arrived. Now we are used to the flora and fauna. We were just driving by and saw this wedding going on, so we took a picture. Don’t they look lovely in white. It was held in a park, overlooking the blue ocean. Some of the cattle are friendly but the frogs and lizards are less so. The flowers, trees and the sky are always colorful. Instead of traffic lights, they use a lot of roundpoints. Some of them are quite interesting. They often have historical stories about the statues and their ancestor’s fight to become free. 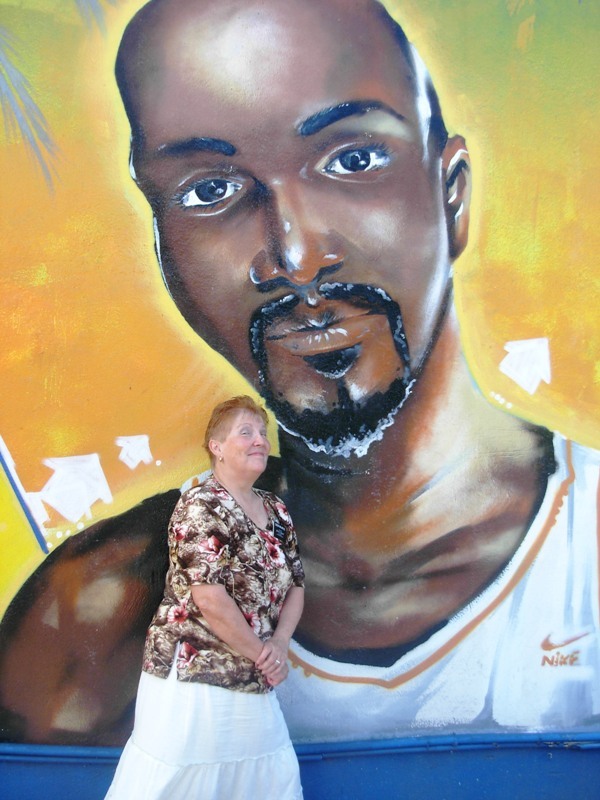 There are also many murals on the walls. Some of them are quite artistic. One of the islands we travel to is St. Martin/St.Maartin. Half of the island is French and half is Dutch. The Dutch side is very American and we can buy many U.S. items there that we can’t get or are toooo expensive in the French side or on Guadeloupe. It is also a beautiful island and has two Branches of the Church, one English speaking and the other French. The missionary couple there is the Coleman’s. They have become dear friends and we get to visit now and again because they come to Guadeloupe for Mission Zone Conference and we go there for the District. We always have a great time with them. They have an extremely interesting conversion story that we will record later. Here are some pictures of the island, the hotel and a few of the members. We went out to dinner with the Coleman’s and when we walked into the restaurant, someone said, “Hi Missionaries”. We turned around, and low and behold there were six American ladies on vacation. They are returned missionaries, who meet and go on vacation every year. We had a lot of fun visiting with them. There are no coincidences, just miracles. Sister Coleman and I made sure that we went Shopping! It is a universal word that everyone understands. This bird I took a picture of walking down the street, was probably going shopping too. Our Zone Leaders (Hooson/Arbizo) try to hold the meetings in a different place, now and again. They met here on the beach and used the natural area for object lessons. It was on trust ,and they asked some of the missionaries to fall backward into the arms of other missionaries. No one got hurt, so it was effective. What a handsome group, except one of course.